The folks at the University of Georgia Press who administer the Flannery O’Connor Award for Short Fiction have done a stellar job of “discovering” new talent. The list of winners includes Dana Johnson, Lori Ostlund, Ha Jin, Bill Roorbach, Amina Gautier, Antonya Nelson, Debra Monroe and, in the last few years, Monica McFawn and Karin Lin-Greenberg. One of the two 2016 winners was Anne Raeff, an English teacher at East Palo Alto Academy. 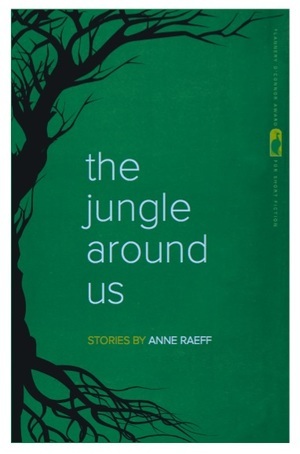 UGP recently published The Jungle Around Us, a collection of Raeff’s stories, which were previously published in literary journals like Guernica, New England Review, and Antioch Review. The Jungle Around Us is a darkly compelling series of stories set in places we rarely visit and know little about, from southern Mexico and Nicaragua to Bolivia and Paraguay. The characters share a sense of dislocation, literally and figuratively, and Raeff coolly probes their psyches and actions as they try to orient themselves to threats both real and imagined. Yes, there is jungle, as well as war, heartbreak, loss, memory, and identity, all surrounding, oppressing, and confusing these characters. Raeff’s narrative voice and prose style are calm and hypnotic, a contrast to the intensity of her characters’ struggles. The centerpiece of the collection is a quartet of stories featuring sisters Juliet and Simone Buchovsky, in which we observe the two young women as they try to make sense of the mystifying adult world. In “Keeping an Eye on Jakobson” they encounter the man who is only referred to by his surname, sitting in their back yard and smoking big, smelly cigars while discussing the Vietnam War with their father Isaac and his woman friend, Mrs. Tuttle, whose son is off fighting in the war that has so disturbed Jakobson. In “The Buchovskys on Their Own” their father, forced to travel to Russia to do research for his book, leaves the girls in the care of his friend, Katja Ladijinskaya, whom he has known since their families immigrated from Russia together in 1941. During his time in Russia, Isaac and his daughters discover that people and places are not at all what they expect. “Maximiliano” finds the adult Simone, now a home health care worker, visiting Juliet in Asuncion, Paraguay, where she is living with an older man and his precocious young son, Maximiliano. In a setting unlike any she has experienced, Simone is perplexed by Juliet’s choices and the mysterious comings and goings of Raul but intrigued by his son’s gentle nature and fascination with birds. The sisters find each other inexplicably foreign after years in which one has lived in New Jersey and the other in places like Paraguay. “Chinese Opera” concludes the collection with an exploration of the effects of the murder of their neighbor, Danny McSwene, with whom the sisters once listened to music and practiced dancing. “After the War” concerns Karl and Margot Epstein, who fled Vienna to avoid the Nazis and ended up waiting out the war in the jungles of Bolivia. After six years, they immigrate to New York City, where they struggle to adjust. Although New York City is not unlike the Vienna of their memories, they have been marked by their time in Bolivia and it has affected their marriage. Karl had tried his best but he never felt part of Bolivia. He found some solace in his friendship with the drug addicted priest Antonio, in scenes that remind one of Graham Greene’s work. But the ghosts of the past follow Karl and Margot to their new life in the new world. In “Sonya’s Mood,” we meet the daughter of Karl and Margot, living in New York City in the late 1980s, as AIDS decimates part of its population. She was 11 when they left Vienna and 17 when they moved from Bolivia to New York City. Now, approaching her 60th birthday, she still daydreams about Bolivia and listens to her “scratchy old 78s. They sound right to her, even though they are full of static and skips.” The music recalls her first love, Luis. Despite her long marriage to Dan Cohen, her moods have only worsened rather than faded. She meets a gay friend, Rick, for lunch, and his stories of heartbreak and newfound romance add kindling to her low but long-burning flame. “Carlito on Pink” introduces us to Kenard, a 16-year-old American student in Nicaragua who is equally possessed by his new passion for photography and the developmentally disabled son of his host family, Carlito. At home, his father is in jail for murder and his mother is going through a series of boyfriends. Kenard’s life at home is limited to school and the Boys and Girls Club, so the school trip to Nicaragua offers him escape and time to think. Carlito becomes his preferred subject. Raeff’s stories are subtle and haunting, and I occasionally felt as mystified as her characters in sorting out the import of people and events. I was rewarded by second readings, a sign of rich, complex stories that, like the characters within, don’t reveal all their secrets at first meeting. There is a quiet confidence to Raeff’s writing that belies a fierce intellect unafraid to confront the darkness in the jungle around us.